eager to preserve their heritage and their city’s traditions, i.e. Lyon’s cuisine. To do this, it has created the Les Bouchons Lyonnais certification. 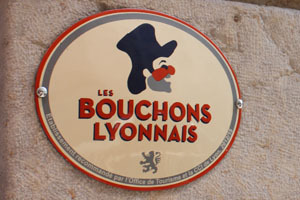 The Les Bouchons Lyonnais association was created in November 2012 to safeguard and sustain Lyon’s culinary tradition. The term bouchon lyonnais is not a registered trademark and can be used by any restaurant. Over the past few years, numerous establishments have called themselves bouchon lyonnais without however respecting the fundamentals of this tradition specific to Lyon. This association brings together people with the same vision of Lyon’s cuisine, striving to restore and promote the authenticity of the bouchon lyonnais. It provides quality services while respecting Lyon’s tradition. The Les Bouchons Lyonnais association guarantees the quality of this type of cuisine as well as transparency for customers. To join the association, obtain the Les Bouchons Lyonnais certification and use the Les Bouchons Lyonnais trademark (registered when the association was created), the restaurateur must agree to an audit conducted by an independent firm. This audit includes several objective criteria relating to different domains: food products, personnel and customer relations, interior décor, the environment and exteriors, and finally health, safety and cleanliness. This association was created by proactive bouchons with a shared vision of Lyon’s cuisine, upon the initiative of the Lyon CCI and in partnership with ONLYLYON Tourisme et Congrès. Christophe Marguin, head of the Lyon CCI’s Tourism Commission, led this project. He believes that the cuisine of the bouchons should feature prominently in Lyon’s history and heritage. Promote the economic development of Lyon’s bouchons by offering a deeply rooted, quality family culinary tradition in a unique and historic location. Promote, safeguard and sustain this tradition specific to Lyon and preserve all its characteristics. Promote Lyon’s internationally renowned culinary specialities. Respond to the expectations of national and international customers in search of a genuine Lyon bouchon. Contribute to the Lyon region’s attractiveness as a tourist destination. … a puppet created by Laurent Mourguet in 1808. Derived from the word gnafre, meaning shoemaker, cobbler, Gnafron is the companion of the famous Guignol. A lover of fine Beaujolais wine, as is apparent from his face, this character is funny, generous and a bon vivant. A genuine emblem of the city of Lyon, this puppet is an icon for all Lyonnais, young and old alike. This is perfectly in keeping with the spirit of Lyon’s bouchons: good food and wine, in good spirits. The association created the certification to guarantee the respect of Lyon’s culinary tradition for the customers, as well as the quality and origin of local products, home-made family cuisine, a warm welcome and a typical Lyon ambiance in an historic setting.